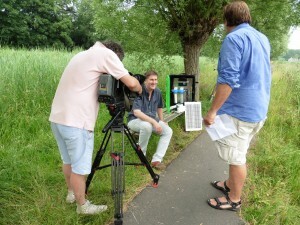 Last week our director Martijn Nitzsche was interviewed for Dutch National Television. For the movie, please press here. Reason for the interview was the successful expansion of the water shops concept in India. In this country AAWS will, in close cooperation with its partner Cordaid, install and operate hundreds of water shops in the coming years. These are small water factories, located in villages and designed to deliver high quality water at low prices to poor people. The water shops are unique because they are operated on a financial sustainable basis. Investments done to set-up water shops are repaid in 4 to 5 years’ time making it possible to reinvest the money in the setup of new water shop. The interview will be broadcasted on Dutch television –probably- on the 30th July 2015 in the news program of EenVandaag, NPO 1 and later shown on the AAWS website.